Hello all and welcome again. I love the little community we're building here. Large enough to be interesting, small enough that we can get to know one another better. 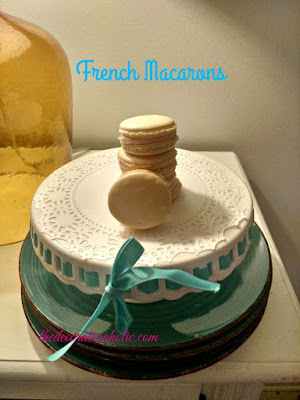 This weeks features are Trish's French Macarons. Trish made these for her daughters baby shower. They look delectable...yummo Trish! Liz's painted skulls...I have some nephews who are going to LOVE these for Christmas! 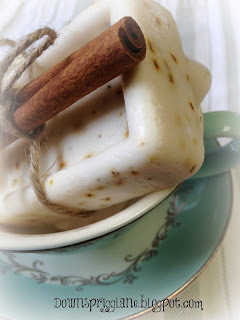 And Cheryl from Down Sprigg Lane, shared her divine Goats Milk Soap on her pretty blog...you must see! I'm early to the party,so I will return in the am to visit with guests. Thank you for hosting us, Mimi! Thanks so much for the party, Mimi. And a special thanks for featuring my French Macarons. Thank you Mimi! Always love to come to your site and see what you are up to! Thanks for hosting this lovely party! Have a beautfiul week my friend. Thank you so much for featuring my skull!! Have a great weekend! Good morning Mimi. I didn't see a link to the features. Wanting to visit that goat soap recipe :) Perhaps I am missing something... Have a lovely weekend and thank you for hosting! Thank you for featuring my Goat's Milk Soap, I appreciate it so much. Thank you for the party, have a wonderful weekend!! Hi Mimi- another wonderful party- thanks for hosting! Mimi, life is good. Weather is nice, we are blessed to have such wonderful blogging friends, and you are hosting your wonderful party. What else can we ask for? Have a great weekend. What dreamy features this week. Thanks so much for hosting such a great party each week Mimi.